It could have been any number of towns that snake along the backbone of the mountains, and dive into the verdant valley that follows the river: muddy in the spring, engorged with all that rain, melting snow, and remaking a boundaries. The New River, the second oldest river in the world meandering through the Appalachians in Virginia. You tell someone that and they apprise you with a strange countenance – disbelieving, marveling at the oddity of something so old and yet so close. I’ll bet you could hear the music before the field opened up. I’ll bet the path through a thicket of trees was pressed down with those skimming over the surface fast and following the beat. In the clearing, around the makeshift wooden stage, people would have been dancing, looping around in circles, stepping together in orchestrated tapping – all elbows and feet spinning with a beat – a beat not hammered out or expelled hastily. Rather it was pulled across all those strings and likewise pulled a body along with it. “What is this?” she would have asked him. He would have looked at her, half bemused and half perplexed. “But what kind?” she would have insisted. Ginny would have tried to map the notes she captured in her ears, imagined it graphed out in shapes on a page. “There aren’t kinds of music. Music is music,” he said and pulled her toward the circle of those dancing. She would have protested, not knowing the steps. “There aren’t steps,” he would have insisted, “they’ve all been dancing together so long that they just do it all the same.” He winked at her. They stayed on the periphery of the circle, dancing till the sweat beaded along their faces and the flush of exertion made their cheeks red. She slipped off her shoes, letting the grass ride between her toes. Her sweater was abandoned and her bare sun kissed arms shone. The long ponytail her hair would have been gathered in swished around her head and the stray strands fell across her shoulder. One band departed the stage and another waited in the wings. A small man with a lilting, radio ready voice announced the next act, drawling out the words in a thick, heavy accent. Ginny couldn’t make out the words. But it wouldn’t matter, you wouldn’t be able to find those bands on a marquee somewhere or on an album cover. This was the moment to savor, it couldn’t be played back – the twang of the banjo, the man picked at it in a different way – slapping the strings. She recognized some of the tunes, like “Banks of the Ohio,” but others like “The Swapping Song” were new to her. Odd lyrics that had been traced down from person to person like the ancient stories were once communicated. Nothing at face value, it was the song your father hummed when he chopped wood, or skinned a rabbit for dinner. 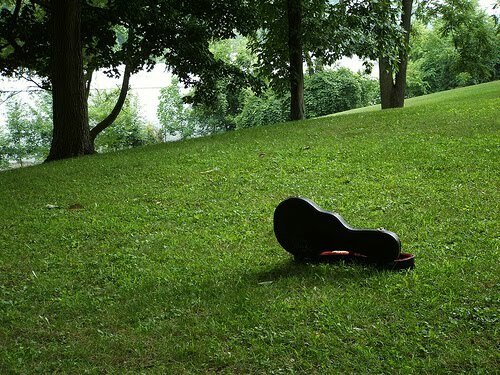 He or an uncle or brother would pluck out notes on the old guitar after a long day and the smell of pipe tobacco would linger on, a piece of that same spiny, alien plant that burned the land. The same brown, dark earth held all these sounds together. This was the land of music where you were born into it, lived with it just like every ordinary piece of life – washing, eating, cleaning, fighting, loving, pain, joy and suffering. All that living was in there, in the space between the notes. That is how you hear the sound, by measuring the distance between. All that history was thrown together in that pattern of notes and in the lilt of a voice, the soft cadence of a bow kissing the string or a finger strumming out a tune. It can sound like any kind of thing – a storm, an animal, a laugh or a cry. The pair stopped dancing, out of breath, and tumbled down to the ground. The hum died out beneath them and was swallowed whole. I picture Ginny leaning back on her elbows, with her eyes closed and imagining the instruments as voices that conversed in a language that only she could understand. But even if you didn’t understand it you could feel it working raw, unadulterated and slipping into the bone. Gnawing. It was celebration, it was lamentation, and it was all these things at once. Ginny looked over at William at his long body stretched out too close to her bare legs. The music continued to liven the air, to make its presence known and press against those who opened up to the dialogue. People pawed their hands together in appreciation, the clap rippling around the grass in a crescendo. To those who were older, it was the nod of recognition – everything comes full circle – light to dark and then back again. The world had at once been broken apart and put back together again. Something had died and risen again. To her, to Ginny, and to the young and lucky untouched by grief, it was the space of darkness and the abyss of something deep and unknown, followed by that feeling of being untethered and free to roam. The sun was going down and the shadows grew long. This must have been the moment that my grandmother, Ginny, fell in love. With music and with William. Did they kiss in the swollen silence that followed? I can almost see it. Even before you mentioned the Appalacians, I knew the setting. Really lovely and evocative. So lyrical, Jenn. Amazing. Man, did that bring me back to VA.
She slipped off her shoes, letting the grass ride between her toes. I want to move there now. This was beautiful! Lyrical, like Sunna said. Well done. Beautiful way to describe a love of music. Leaving us wondering about the first kiss is a great way to end this teaser. Wow. Your descriptions are powerful. Beautiful language. Your writing is so lyrical and beautiful. This is srsly lovely. Especially love the descriptions of the music–very powerful.